Published: May 7, 2013 at 09:26 p.m. Updated: May 8, 2013 at 02:49 p.m.
Young was arrested twice in 15 hours by the Moreno Valley Police Department in Southern California on Sunday, according to details obtained by NFL.com. Sgt. Lisa McConnell of the Moreno Valley Police Department said at 12:01 a.m. on Sunday, police conducted a traffic stop after Young drove into oncoming traffic and made an illegal left turn directly in front of the patrol car. Young was arrested on suspicion of DUI. Hours after he was released from the detention center Sunday afternoon, police responded to a call at 2:22 p.m. about a man jumping over the fence of a tow company yard. It turns out it was Young looking for his black Mustang that was towed following his DUI arrest. 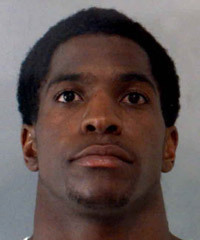 Titus Young mugshot from Sunday, May 5, 2013, courtesy Riverside County Sheriff's Department. The Oakland Press originally reported on Young's arrests.